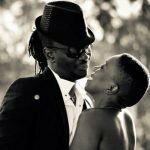 Gospel artist, Wahu Kagwi recently turned a year older and hubby, Nameless did not spare a dime when it came to spending on the beauty. Neither did the former actress and entrepreneur forget to count her blessings: The renowned Kenyan pop artist shared reasons behind their getaway and Kenyans could just not have enough of the love shared by the duo. Nameless kept alluding to the fact that a 3rd born would probably be on the way. Fans were kept busy and glued to their screens as they watched the two savor the moments on social media. Happy Belated 18th Birthday to the mother of two. The post Celebrity power couple plash social media with love, as wife turns 18 appeared first on Ghafla! Kenya.